All of the British North American colonies originally had currency systems based on pounds, shillings and pence, though foreign coins circulated widely. By the 1850s, however, growing trade with the United States and the widespread use of U.S. and certain Spanish-American coins led the colonies to seek adoption of decimal currency systems with dollar, cent and mil units. The first colony (province) to succeed in passing legislation to that effect was Canada in 1857. In the following two years, 1-, 5-, 10- and 20-cent pieces were coined by the Royal Mint in London and were the first of official decimal coins struck for a part of what is now Canada. Some ten million 1-cent pieces were ordered. The quantity was so large probably because the government hoped that the cents would displace the large quantities of privately issued tokens that formed the bulk of the copper circulation at that time; but it was some years before the use of the private tokens was completely abandoned. In any case, it was not necessary for Canada to order more cents until after Confederation. As can be seen from the illustration, the obverse of these coins features an attractive portrait of Victoria as a young girl, by the talented British engraver Leonard C. Wyon. 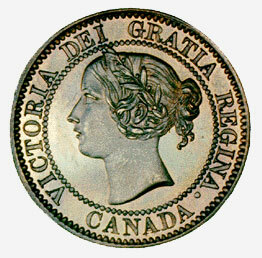 This coin is part of the National Currency Collection, Bank of Canada.